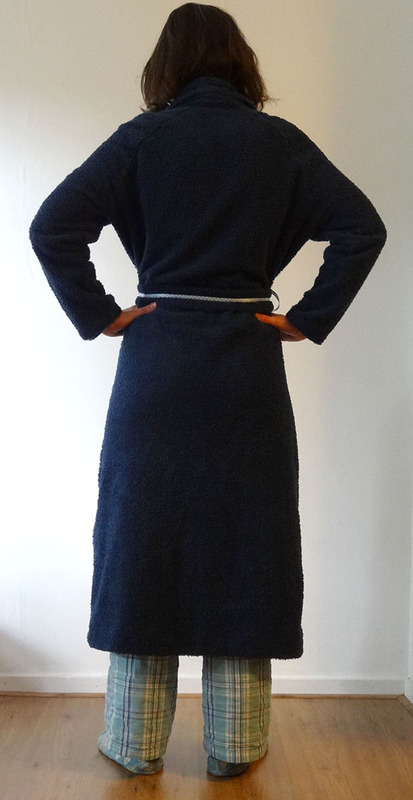 Completed: a new bathrobe, finally! Yes, I actually finished the only item I listed as quite urgent in my wardrobe sewing plan. It’s probably been urgent for the last 5 years though. You won’t believe the state my old bathrobe is in, and I’m not going to show you because it would probably be held against me for the rest of my life. 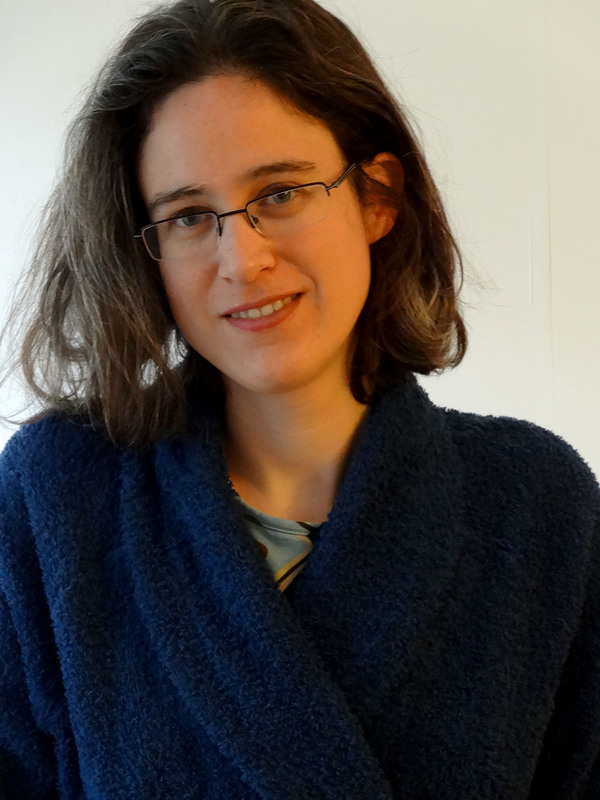 I got my old bathrobe when I was 12 and it had previously belonged to one of the women I was named after. I believe I first started mending it (by hand!) about 10 years ago because the seams started to fall apart. Later it also developed holes. Why didn’t I get a new one earlier? I never really saw one I liked and I usually forgot to look for one anyway when I was in a store (that’s what happens when you don’t like shopping). Yet, a bathrobe is an essential part of my wardrobe because our house gets cold in winter and I wear one in the morning when I’m having breakfast. 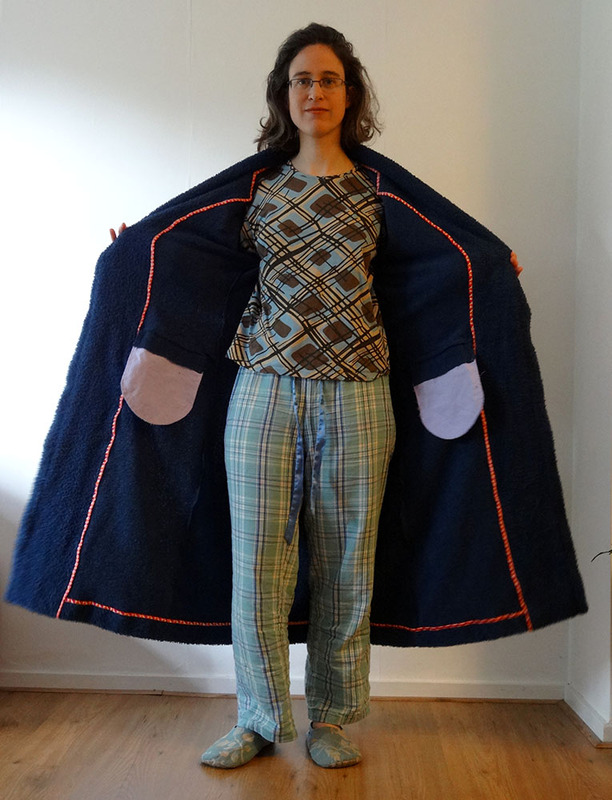 I used pattern 5 from Knipmode December 2010, size 38 and a dark blue terrycloth that feels nice and soft against the skin. 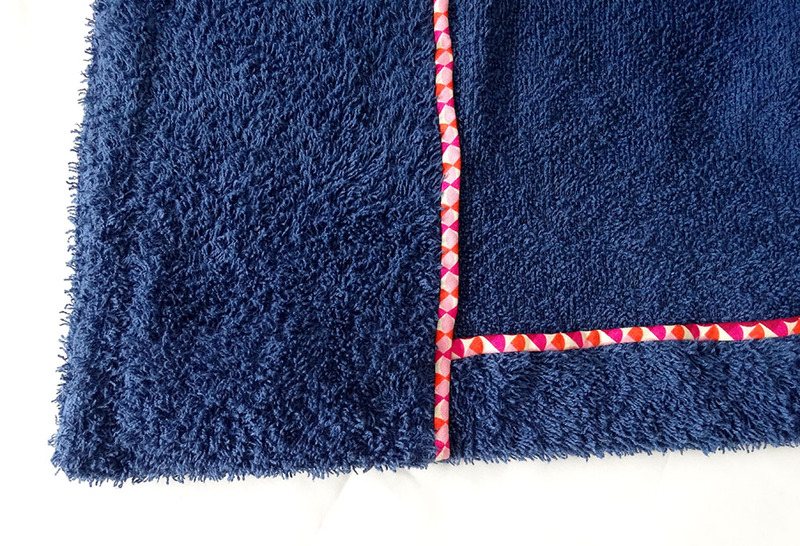 In Knipmode they used polar fleece but I think terrycloth is much more luxurious. Be prepared to get your house covered in fluff though when cutting this type of fabric… Seriously, it gets everywhere… My favourite part of this pattern is the raglan sleeve with a dart in the sleeve head. This dart cleverly turns into a shoulder seam. Yes, this sort of happened to me a couple of years ago but luckily I was wearing something with pockets and could call my sister who quickly came to the rescue. I should probably also add that it is a good idea for someone to have a key to your house so they can rescue you without breaking down the door. So, pockets. I sliced the front pattern piece at the height of the original pocket opening, drew a new pocket pattern piece and sewed it in between the new seam I added. I am relatively happy with how this turned out. It’s not perfect but will do fine and I think they look better than the original pockets. Perhaps I should have sewn stay tape around the opening to prevent stretching out over time? I lengthened the tie because I found the original length a bit on the short side. I also accidently made the tie a bit narrower than the pattern dictates but I think this width is probably better anyway because it’s easier to knot. I also changed the construction. I first folded the tie in half lengthwise, sewed the long edge closed, leaving a gap in the centre for turning. 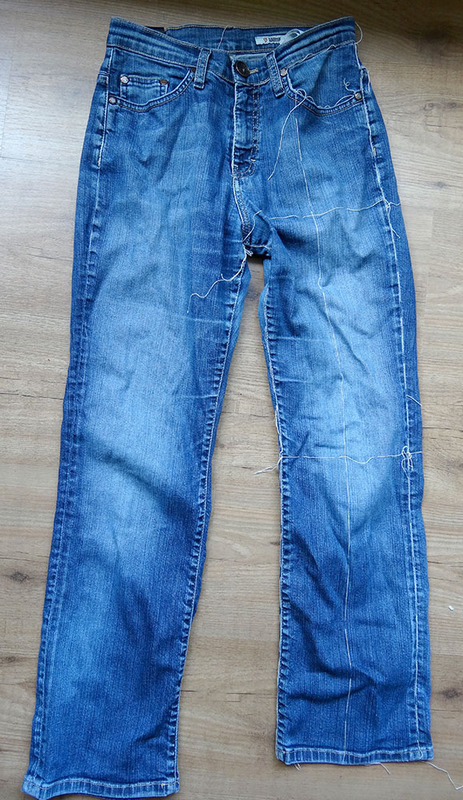 Then folded the short ends so that the seam ended up in the centre and sewed the short ends closed. Then I turned the tie right side out, hand sewed the gap closed and sewed the polka dot ribbon on top of the seam. I think the ribbon adds a nice touch and I also used it to add a loop so I can hang the robe. The upper collar and front facing are one pattern piece. You need to understitch this so it falls nicely when you are wearing the robe. The instructions only tell you to understitch the front facing but I understitched the upper collar part on the under collar and the front facing part on the front facing (leaving a small non understitched part in between, 5 cm or so) so that both parts fall to the correct side when I am wearing the robe. If you understitch the whole pattern piece on one side it will fall weird on either the collar or the front opening. On the inside I deviated quite a bit from the instructions. The instructions have you first stitch the front facing in place and then turn up the hem. I think the way I did it results in a much prettier finish (and I learned this method from another Knipmode pattern, so why don’t they use it here as well???). The way it works is that you first flip the facing right sides together with the front of the robe. Then stitch them together parallel to the hem at the desired hem depth. When you then flip the facing to the inside you get a very nice square corner. I didn’t feel like finishing the inside exposed edges of the upper collar/facing with my overlocker and I also didn’t want to turn them under because that would become bulky. Instead I decided bind the edges with self-made bias tape (Notting Hill by Joel Dewberry for Free Spirit ). After I attached it I felt some regret that I didn’t use this fabric on the outside as well instead of the polka dot ribbon because it looks so good against the dark blue of the robe. Will I use this pattern again? 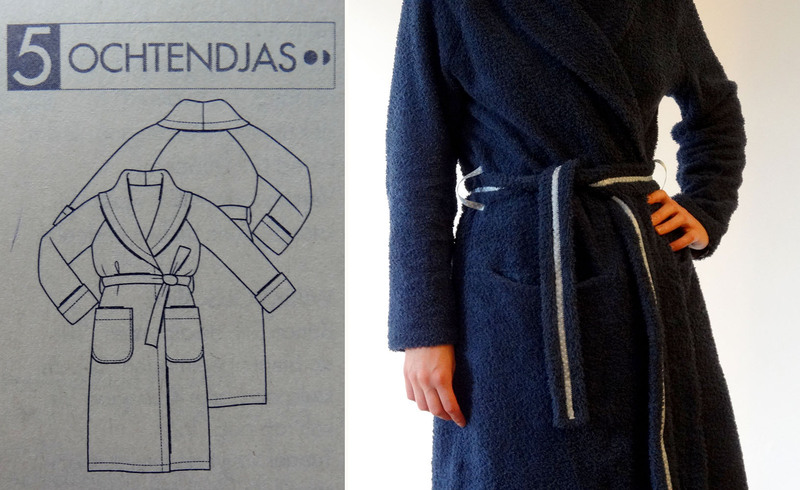 Well, with my current bathrobe track record I guess I am already set for the next 20 years or so but if I need a new bathrobe by that time I might as well use this pattern again because I`m quite happy with how it turned out. To conclude this already quite long post we also have a giveaway winner! 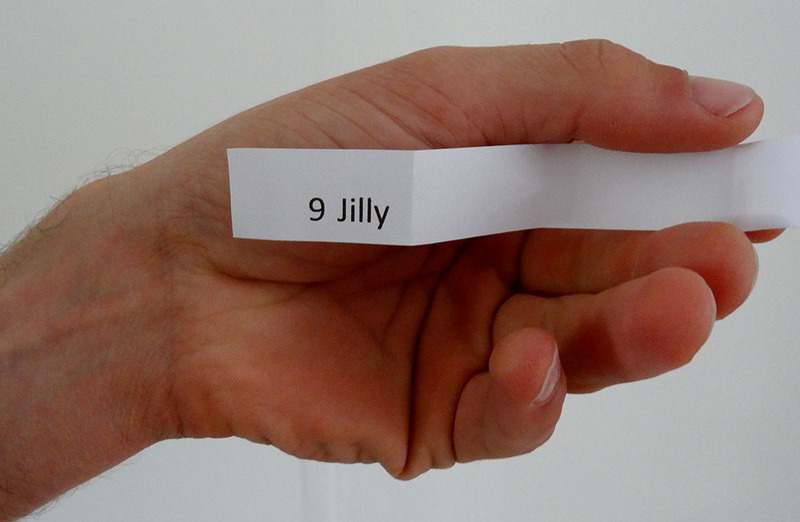 Congratulations Jilly, I’ve already send an e-mail to ask for her address and the Knipmode magazine will quickly be send on its way. 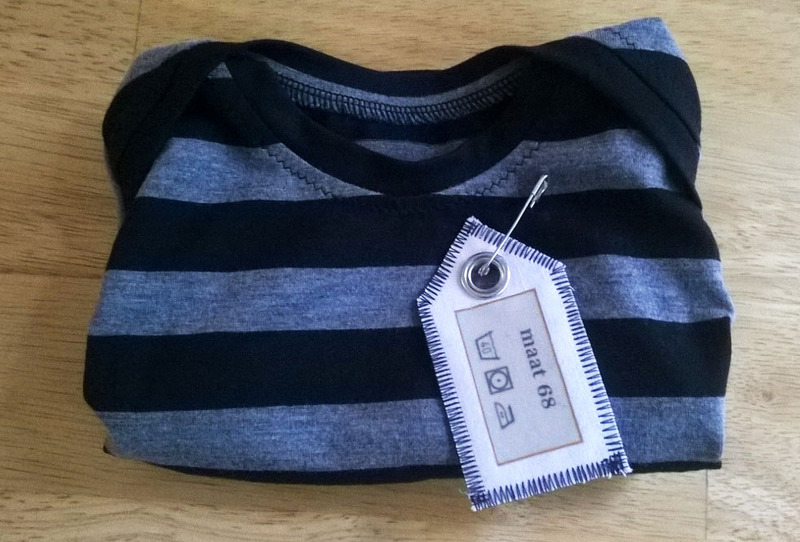 The last time I bought a piece of clothing that wasn’t underwear or socks was June 8 2013, meaning that I haven’t bought any RTW for over a year now! This seems a good reason for some reflections and a little celebration! Was it difficult? No, not at all, but then, I never liked shopping for clothes. I didn’t even realise it had been that long until I signed up for the RTW fast in December. I am definitely going to continue not buying anything this year because it has been a lot of fun so far. 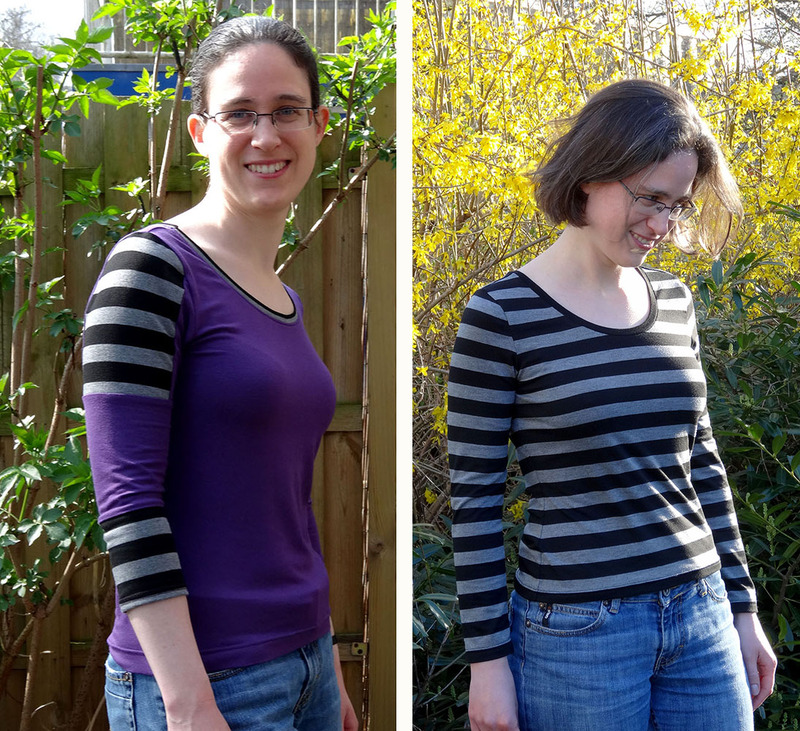 Since posting my original sewing challenge post I have made 2 dresses (here & here), 2 skirts (here & here), 2 t-shirts (here & here) and a scarf for myself that all get worn quite regularly. 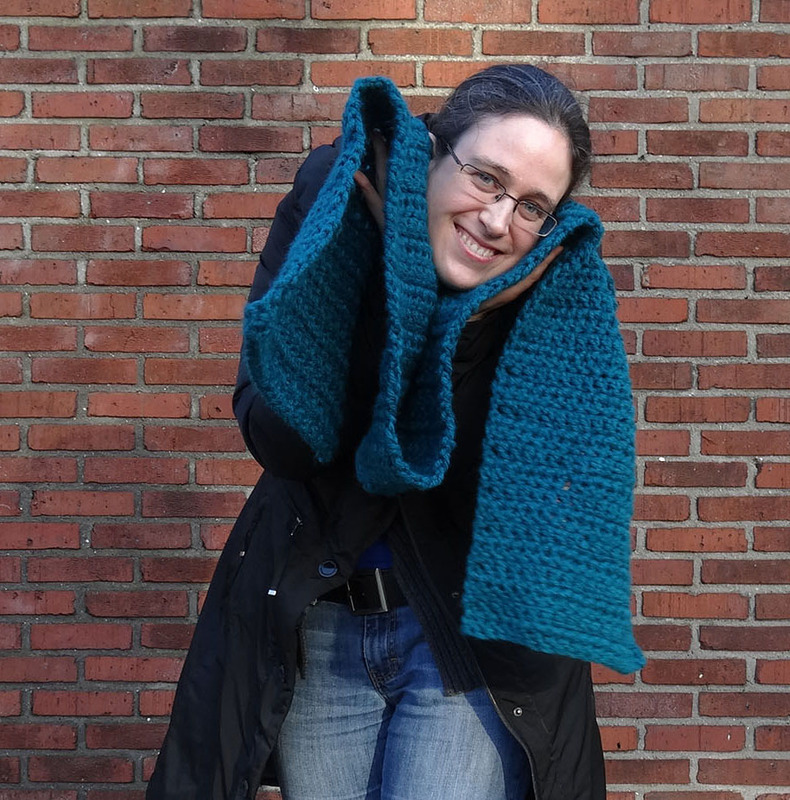 The scarf is a real bonus because I have learned how to crochet while I didn’t plan on learning that. It does offer some new opportunities for making cardigans and sweaters once I get better at it. 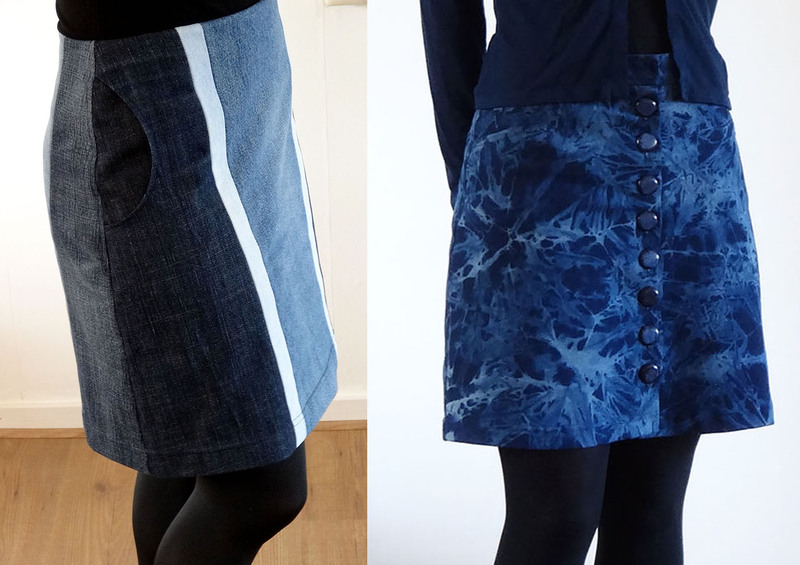 I’ve reached my goal of sewing 2 casual skirts and 2 casual dresses, I do want more though! I especially like wearing the skirt that has a button front placket. Also, would it be really strange to make another Lady Skater dress or should I venture out to other patterns? The 2 t-shirts get worn almost as soon as they are dry after having been washed so those are definitely a success and I probably wear them too often…. I really need more of those. Besides not buying any RTW I’ve also recently passed the 50 post milestone on this blog. My goals when starting out were to blog at least once a week and to post at least one tutorial each month. I believe most of my posts were less than 7 days apart except for a couple of crazy weeks so I’ll call that a success and I intend to continue in this way. Anyway, I’m not going to lose any sleep because “I need to post something”. In the almost 10 months that I’ve been blogging I wrote 7 tutorials so less than intended. This is mostly because my work has been really busy in 2014 (finishing up your PhD apparently tends to be) so I didn’t have as much time and energy for sewing as I would have liked. Tutorials are the first to suffer because they take a lot of time to put together. Hopefully I’ll get another tutorial ready soon because I enjoy making them and based on my blog stats I think the ones that I have made so far are being used quite often. Over 200 people are following my blog, either via wordpress, email or bloglovin and only a small number is biologically related to me. I find photography a necessary evil of blogging. I take pictures because a “hey I made a dress” post doesn’t really work that well without pictures of the finished item but don’t expect dashing photo-shoots from me anytime soon. It’s just not something that I enjoy doing so I am usually satisfied after 5 minutes of trying to take the perfect picture. I think blogging has improved my productivity because I am eager to show new finished items and am therefore more likely to just finish what I am working on instead of starting something new when I reach a boring part. My UFO pile has definitely shrunken in size! I have found new blogs and interesting people to connect with that I am not sure I would have found without my blog and this has been a very enjoyable experience. I do like the interaction with other bloggers. 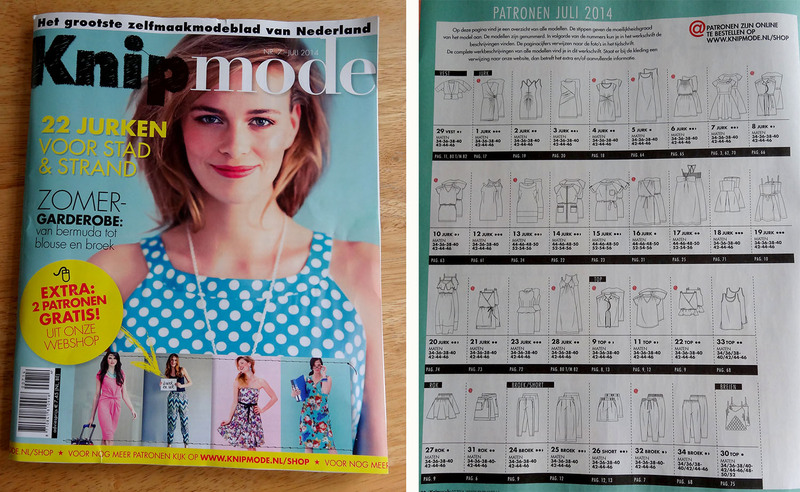 Knipmode July 2014 issue. On the right the line drawings for the patterns in this issue. If you click on the picture you can see a larger version. 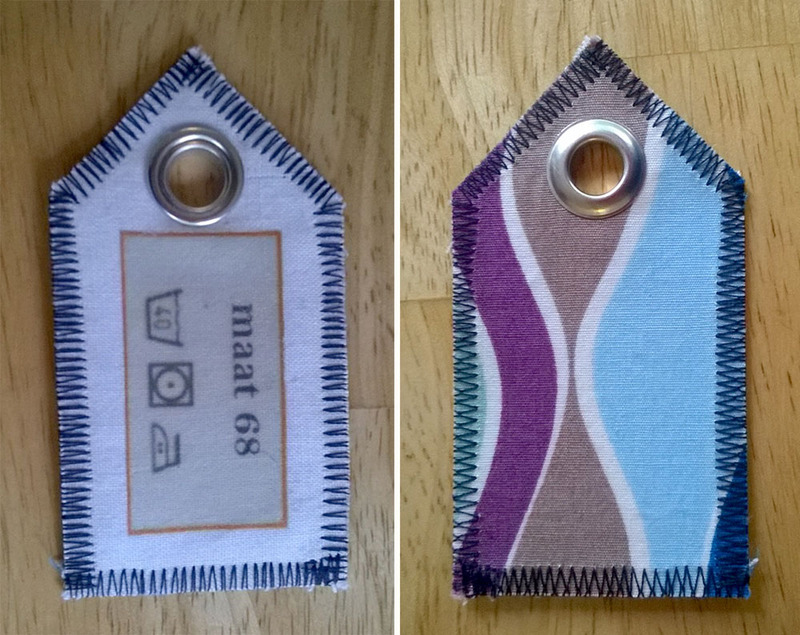 Since so many of my lovely readers are from abroad and also into garment sewing I thought it fun to present you with a giveaway prize that is not so easy to get when you’re not in the Netherlands (it’s not impossible though). The most recent issue of Knipmode! It’s a sewing magazine that I use often. It offers multi sized patterns that have to be traced before you can use them. I don’t think this is difficult because the different patterns are drawn in different colours and the different sizes are drawn in different line styles. Seam allowances are not included in the patterns, as is the case for most European patterns, so you’ll have to add those yourself. Instructions are in Dutch, but I know there are non-Dutch speaking sewers that use this magazine successfully and if you’re still baffled after trying Google translate I am willing to be your personal helpdesk. I own the same issue so in theory I should be able to help you (no guarantees though!). Some of the dress patterns that I like in this Knipmode issue. And then there is this dress… I’m lost for words. 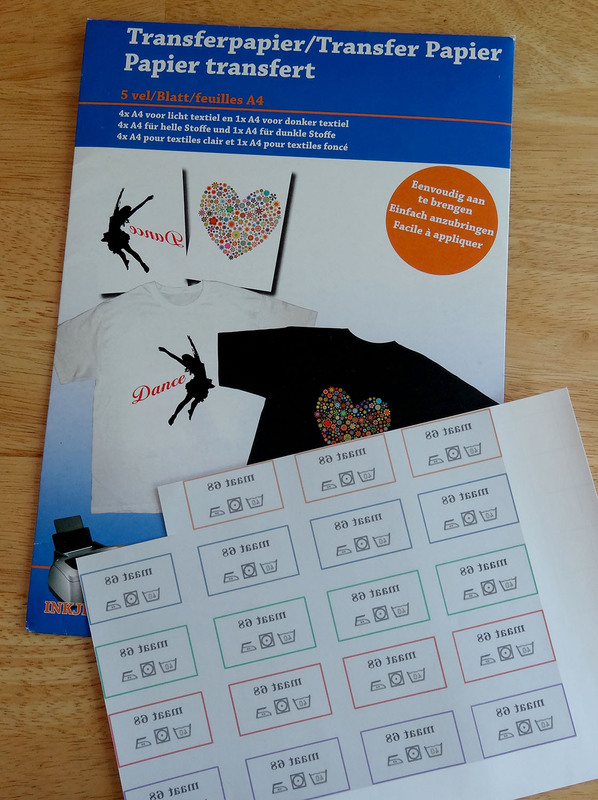 To enter leave a comment that clearly states you wish to enter the giveaway. If you comment but don’t state that you want to enter I will assume you are not interested in the magazine. You can enter until Saturday June 28th, 20.00h UTC+1. One of my reasons for sewing my own clothes is that I want to wear clothes that fit. A well-fitting garment flatters and will also make you feel better when you are wearing it. That was not something I often achieved with RTW clothes but I think I’m starting to get there with the clothes I make myself. The colour of a garment is another aspect that influences how flattering it will be on you. A dress that fits perfectly but is in a colour that makes you look pale will not flatter you all that much. I will even go as far as saying that a dress in a colour that makes you shine but isn’t fitted to perfection will get you more compliments than a perfectly fitting one in completely the wrong colour. Picking the right colour fabric for a garment is as important as picking a pattern that is the right style. It has to work for your body. If you pick a pattern that doesn’t flatter your body type you will end up disappointed with the finished item. The same holds true for the colour. If you pick a colour that is unflattering you are not going to like the garment when you are wearing it and you’ll probably not wear it very often. 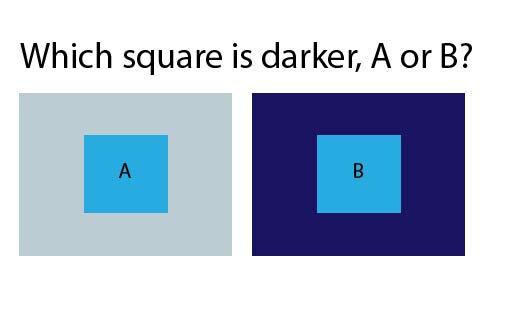 They’re exactly the same shade, but A looks darker than B because the area around A is lighter. The surrounding colours influence how a colour comes across. The colours around your face also influence how your face looks. It’s not always easy though to decide what style and colour will work best for you. I don’t think I was making really disastrous colour choices but I did feel that my choices could probably be improved upon and that I perhaps should be a bit more adventurous to get a more versatile wardrobe. 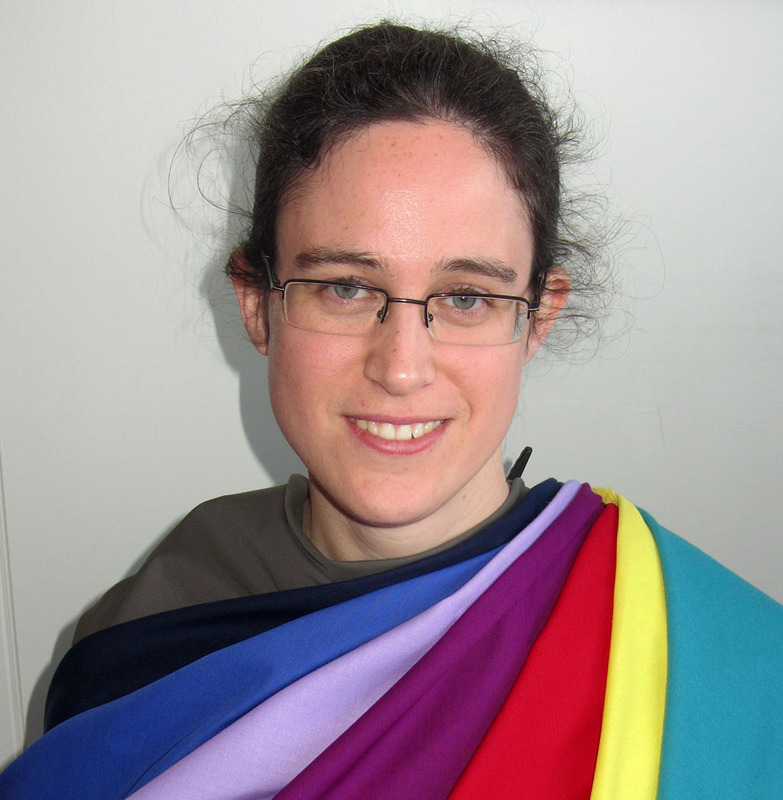 When I make a garment I want to be relatively certain at the start that I’ll be happy with the end product so I make safe choices with the colours that I use. I know blue and purple usually look good on me so I have a lot of blue and purple clothes. I also always end up buying more fabrics in those colours even when I decide at the start of the fabric trip that “this time I am going to get something completely different”. My sister with the autumnwinter colours. I wanted to get a bit more knowledgeable about which colours look good on me and decided to get some professional advice. One of my sisters also wanted to see if she could add some more colours to her wardrobe so we went together to Marjolein.inc in Leiden. 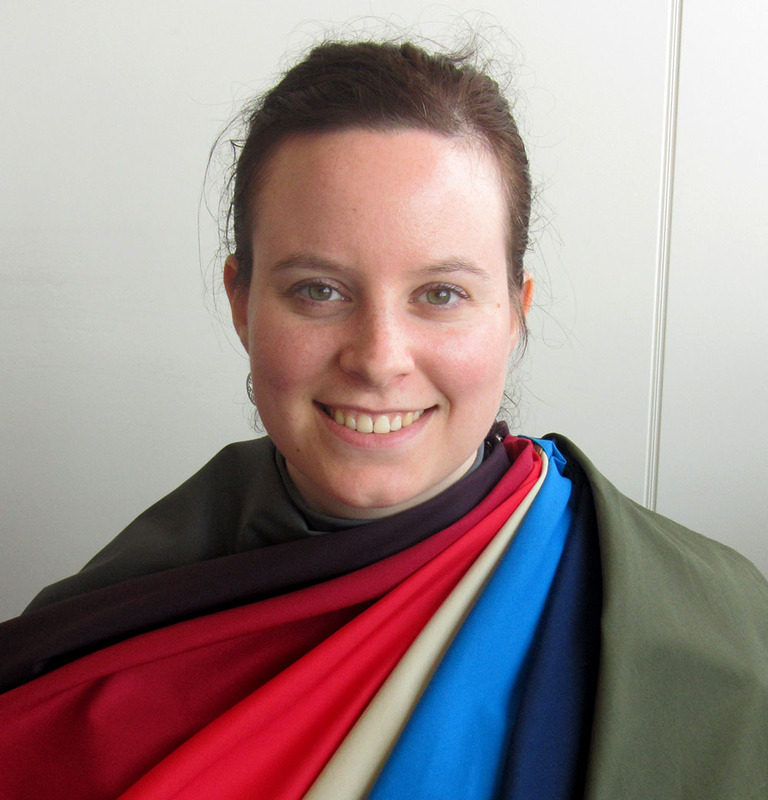 Marjolein works with the 10 seasons system and she uses 10 sets of coloured pieces of fabric to determine which colours work best for you. The fabrics were draped over us and we could see in a mirror what the different colours did to our face. I found it really interesting. Some colours made me look like I was about to come down with the flu while others really made my eyes come out. 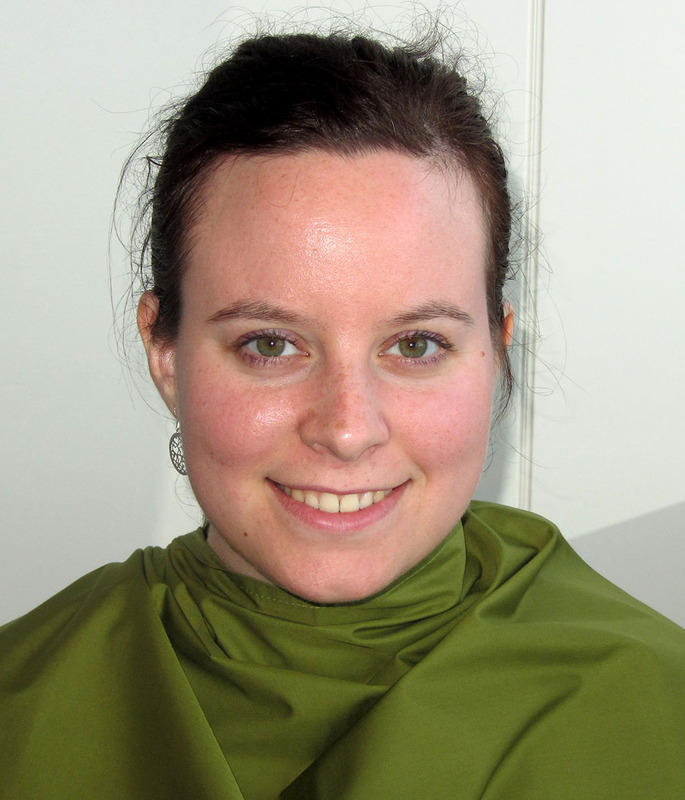 She also compared similar colours from different seasons to show us how subtle differences in colour could sometimes have a quite large effect on how they made us look. To look good you should make sure to always wear at least one of your good colours next to your face. It doesn’t have to be the complete top though, a tank top under a cardigan or a shawl is enough. What colour you wear on your bottom half doesn’t really matter (as long as it works with what you’re wearing on top that is…) so that’s where you should put those colours that you really love but that don’t work next to your face. It turns out I am a summerwinter type and should stick to cool bright colours. These are the colours with a blue undertone. I don’t look too good in the warm spring and autumn colours that have a yellow undertone because they either make me look unhealthy pale or are so strong that I disappear. 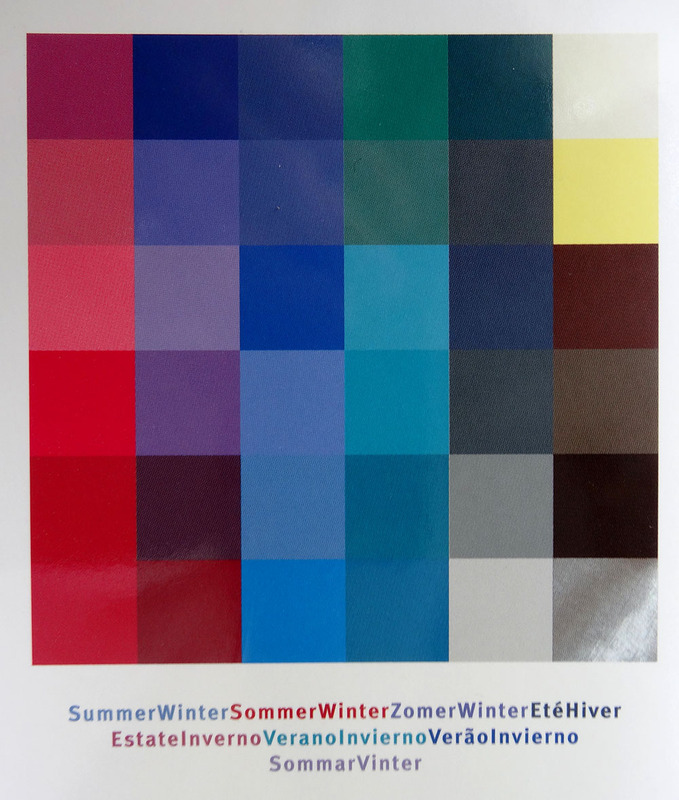 I also finally got confirmation that I was right all those seasons I was utterly annoyed that someone had decided pastels were “in” and finding a t-shirt with a bit more colour was like looking for a needle in a haystack. I need more colour! When I wear jewellery silver is better than gold. It’s a good thing I prefer silver anyway. Stones should preferably also be from the summer-winter colour palette. I don’t wear jewellery often, I don’t have a lot of it and when I am dressing I usually forget that jewellery is something that you can also add to your outfit. Perhaps I should get some in my good colours? We also got some make up advice and while I don’t wear any make up I suppose it is good to know what to look for if I ever change my mind on the topic of wearing it so I’ll at least make a good choice and not have some salesperson try to force a warm colour lipstick on me. My sister was a bit more difficult to figure out. She looked really good with some of the autumn colours, but not so great with some of the others. Especially the darker colours worked well. Just look at her with this dark chartreuse. Her eyes, just amazing. She has to make sure to get a garment in this colour soon! She also looked good with some of the winter colours. Eventually the autumnwinter type worked best overall. It was fun to see that there is some overlap in the colours that work for both us but that there are also some clear differences. We were both already going in the right direction with our colour choices but I can definitely add some raspberry red to my wardrobe because that is a colour I don’t really wear right now but I look pretty good in it. My sister was already mostly wearing dark clothes with a lot of navy and black and she certainly did look best with darker shades. Besides the chartreuse she is also going to add dark eggplant to her wardrobe because she doesn’t have any clothes in that shade right now while it really worked for her. We got a colour card that we can use when we go fabric (me) or clothes (my sister) shopping. I think the card will be helpful to steer me away from my usual choices. I did have some fun with my stash of solid (quilting) fabrics and took pictures of myself with different colours and made a collage of them. They were all taken at the same time so the lighting should have been more or less equal in each picture, I took a single picture per piece of fabric and didn’t do any photoshopping. I’ve arranged them somewhat per colour. If you study them you’ll notice that with some colours the first thing you see is my face and with others the first thing you see is the colour which is not what you want. With some colours my eyes and lips become more prominent. I think you’ll agree that some of these colours are definitely more flattering than others. How do you choose the colour for your next garment sewing project?